Properties in Vaimaanga Tapere average 4.6 out of 5 stars. Property 6: Surf Mist, Cook Islands, 2 bedroom modern home, with private pool, sleeps 5. 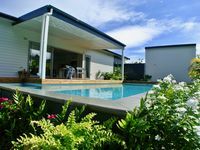 Rarotonga Hideaway - great value for money for a modern private house! 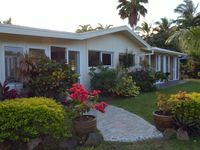 Property 17: Rarotonga Hideaway - great value for money for a modern private house! Ann's Beach House - right on the best beach! Property 18: Ann's Beach House - right on the best beach! Excellent location. Short walk to beach, but not on busy beach road. Terrific pool. Elegant and very complete kitchenware. Outstanding layout for two couples. Good value for price.